19th Annual Performance Race Week – April 28-May 4, 2019 – SOLD OUT! Offshore Sailing School — America’s #1 Sailing School — is Celebrating 55 Years! and began a legacy of providing the best and most expert sailing and boating instruction in the United States. At that time there were NO other sailing schools in the U.S. Since then the company has graduated more than 150,000 adults and their families in sail and power courses running the gamut from basic sailing to cruising, passage making and racing; has fulfilled a growing demand for special programs in leadership and team building for universities, corporations and private groups; and provided hundreds of flotilla cruising vacations all over the world for graduates and sailors who love to sail with six more scheduled for 2019. Steve and Doris Colgate remain dedicated owners and leaders – at the helm and in the office every day except when on vacation somewhere on the water. Fun events and specials are in the works as the Company prepares for the next 55 years. You can read more about the celebration here . . . In recent sailing news, dates for a record six Colgate Sailing Adventures Flotilla Cruises are now open for enrollment in the Windward Islands, British Virgin Islands, Spain, and Croatia, and two sailing vacation trips are already sold out! These adventures are for Offshore Sailing School graduates, guests and other sailors with US Sailing or ASA Bareboat Charter certification. Guests are welcome on these inspiring, eye-opening cruises where you see the world under sail and pack and unpack only once. For more information, click here. Power boating enthusiasts can learn to handle a sleek power catamaran like a pro on Offshore Sailing School’s newest addition to its fleet in Southwest Florida. Check out this page and sign up today as space is very limited in this exclusive Fast Track to Power Cruising Course on a brand new Fontaine Pajot MY 37. In a recent issue of Coastal Living’s digital and print magazines, Offshore Sailing School is featured as one of “5 Incredible Getaways Where You Can Learn Something New.” Click here to see a copy of both editions. Jeff is an avid sailor, who took a Fast Track to Cruising Course at Offshore Sailing School in 1964, then a Performance Sailing Course and went on to purchase a 42′ cruising yacht to put in The Moorings fleet. His heartfelt essay really captured our judges’ hearts. Read Jeff’s winning essay here. Congratulations, Jeff! The International Hobie Class Association (ICHA) announced the 22nd Hobie 16 World Championships will be held at South Seas Island Resort on Captiva Island, FL November 1-16, 2019. It’s a perfect time to learn to sail with Offshore Sailing School and experience World Class excitement at Offshore’s premier Florida resort location. Read the full story here . . .
Offshore Sailing School is proud to continue its national sponsorship of LLS to help find cures for blood cancers. Since 2009, Offshore Sailing School has raised more than $140,000 to support the Leukemia & Lymphoma Society and donated hundreds of sailing certification course tuitions for Leukemia Cup Regatta Auctions across the country. In honor of our 10th Anniversary as an LLS supporter, and our own 55th Anniversary year, we are asking all students booking courses in 2019 if they would like to “round-up” their course payment and Offshore Sailing School will donate this “round up” amount on our students’ behalf, to LLS during the organization’s annual Fantasy Sail Celebration Weekend December 6-8, 2019. The top Leukemia Cup Regatta fundraisers in the nation will gather together for a fun-filled weekend of sailing and celebration, hosted by Offshore Sailing School at its partner location, the Pink Shell Beach Resort on Ft. Myers Beach, Florida. View Fantasy Sail weekend event details here. Association (NMMA) which promotes boating and sailing through its Discover Boating program. To better understand the impact boating has on minds and bodies, Discover Boating teamed up with one of the leading researchers on the health benefits of the water, Dr. Wallace J. Nichols, marine biologist and author of Blue Mind, the bestselling book on the scientific connection between water and happiness. 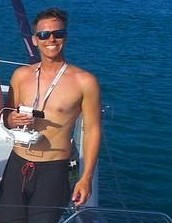 Offshore Sailing School has been preaching for years, that sailing reduces stress and gets you to relax. Now we know what we always believed, because “Boating triggers a restful state,” according to the Discover Boating collaboration with Dr. Nichols. “The effect of boating on our lives, and its fundamental connection to our planet’s waters, are well documented from an economic, ecological and educational perspective,” said Nichols. “But, the relationship of a boat to our health has been largely overlooked. We now know, thanks to science, that the mere sight and sound of water promotes wellness by lowering cortisol, increasing serotonin and inducing relaxation. It only makes sense that being on a boat is one of the best ways to access the wellness benefits of the water.” Amen! Sign up for a course with Offshore Sailing School and enjoy wellness adventures for life! Read more about why boating is so important here . . .
Melanie and Allan Macdonald are Offshore Sailing School graduates of the Fast Track to Cruising Course in St. Petersburg, FL. Living in Calgary, Canada they were landlocked and decided to participate in the 2017 Gulf Islands Flotilla Cruise organized by Offshore Sailing School. 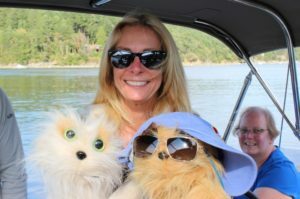 This fun article is about their participation in that flotilla cruise and more sailing adventures they have embarked on. 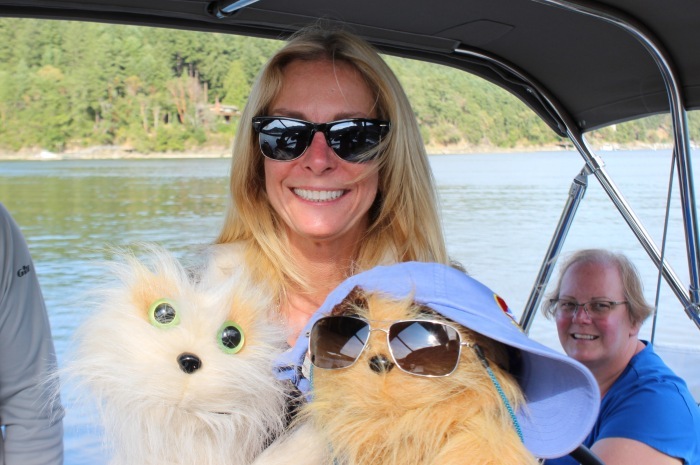 Flotilla cruises are great for making friends, they say. Click here to read the article in Canadian Yachting magazine. Heather and Nate Atwater, who run Offshore Sailing School’s Colgate Sailing Adventures flotilla cruises, received well-deserved accolades in WindCheck’s On Watch section June 6, 2018. 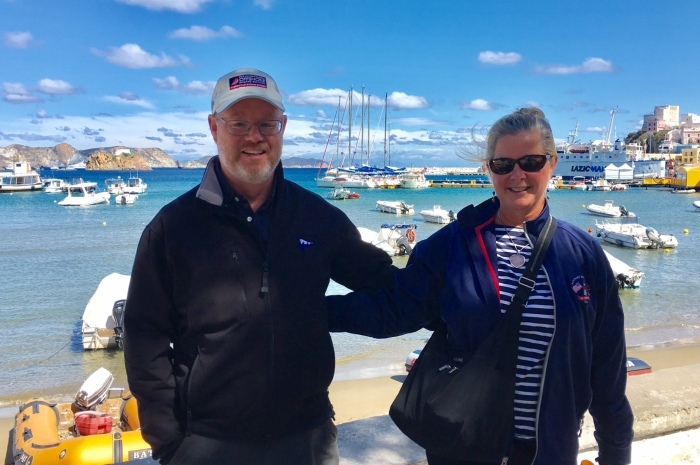 The Atwaters lead the Belize Flotilla cruise in May, and are currently in Greece leading that cruise too. Take a look at this nice article and then you’ll wonder why you haven’t yet signed up for one of these fantastic flotilla sailboat vacations. Offshore Sailing School has expanded in Southwest Florida, with its newest location at The Westin Cape Coral Resort at Marina Village, where Learn to Sail courses on Colgate 26s, cruising courses on a 48′ Leopard catamaran, and corporate events are available. Read the press release here . . . In the April 7, 2017 online travel.usnews.com release titled “America’s 6 Top Adventure Resorts, US News highlighted learning to sail with Offshore Sailing School! Here’s a copy of what they posted on line. With the launch of Colgate Offshore Sailing Adventures™, Offshore Sailing School is doubling its focus on special sailing events at its key resort operations and broadening the scope of its cruising program for graduates and sailing enthusiasts. Click on this press release to learn more! 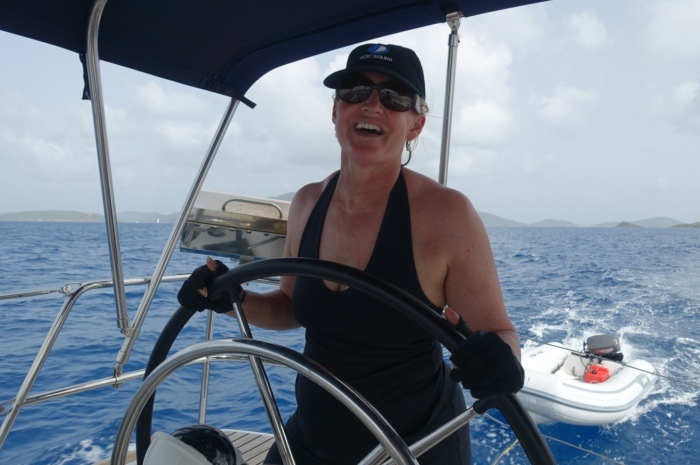 The 2016 Charter Issue published by Cruising World Magazine just arrived in our mailbox, with a fabulous story by Lisa Gabrielson called “Time to Grow Up.” It’s all about her experience in the Colgate Offshore Sailing School Fast Track to Cruising Course in the British Virgin Islands. You can read it here! We won!!! Over the last year, the Luxury Travel Guide contacted more than two million subscribers to invite them to vote for the best experiences they have had. Offshore Sailing School won the Sailing Company of the Year for United States of America, of in the Luxury Travel Guide Holiday & Tour Specialist awards. This was based on achievements and strengths in the travel industry. BoatU.S. kicked off its 50th anniversary this year, highlighting events, products and people that made a mark in the past 50 years. 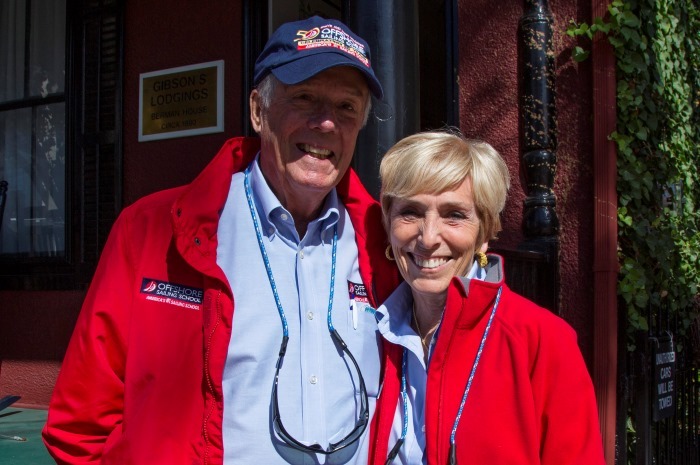 Steve and Doris Colgate lead the Leaders and Legends feature with “Teaching the Joys of Sailing” in the April-May 2016 issue of BoatU.S. Magazine. America’s #1 Sailing School® is expanding, with positions open on the Company’s management, faculty and sales teams. Headquarters are in sunny Ft. Myers, Florida with branch locations in six resort areas in Florida and the British Virgin Islands. Read more . . . Dates are now set for the second annual Doris Colgate Jr. Women’s Clinic & Cup hosted by Edison Sailing Center in Ft. Myers, FLa. Coached by Olympic sailing star Paige Railey will be held November 19 and 20, 2016. Doris Colgate is President & CEO of Offshore Sailing School based in Fort Myers and is a leader in the sailing industry. The purpose of this annual event is to “train, empower and encourage girls and women to take the helm, and become comfortable competitors in the sailing world.” Read about last year’s event here . . .
On October 4, 2015 at the Bay Head Yacht Club in Bay Head, NJ, Offshore Sailing School’s founder and chairman was inducted into the National Sailing Hall of Fame. He shared this honor with just five other members of sailing’s significant contributors, including two Olympic medalists. The primary mission of the National Sailing Hall of Fame is to preserve and share the legacy of passionate contributors to the sport. Steve and Doris Colgate’s Offshore Sailing School is featured in the February issue of Avenue Magazine. Learn more about their worldwide sailing adventures and why they enjoy still being at the helm of America’s #1 Sailing School®! Convergence: A Voyage through French Polynesia, by Sally-Christine Rodgers is a beautifully illustrated travel narrative about a family’s journey to and around the South Seas. “This is a book that transports you to another world, one that you won’t be able to put down,” says Colgate. During 2014, Offshore Sailing School ran a contest for anyone who had taken a course or sailing lesson, participated on a flotilla cruise, sailed in a corporate or group adventure, or any other program provided by Offshore Sailing School. Entries were judged by the editors of Cruising World magazine. To view full details click here. Founded by Olympian and America’s Cup sailor, Steve Colgate, in 1964, Offshore Sailing School provides sailing instruction at all levels from Learn to Sail to Offshore Passage Making, and leadership and team building programs for university groups, corporations. The company has six locations in Florida and the British Virgin Islands. For more information contact Beth Oliver, Director of Marketing at Boliver@OffshoreSailing.com or 239-985-7516.